In July 2015 I took part in a week-long artist residency at Norwich Cathedral where I created my first site-responsive artwork using organic materials gathered from a tree. 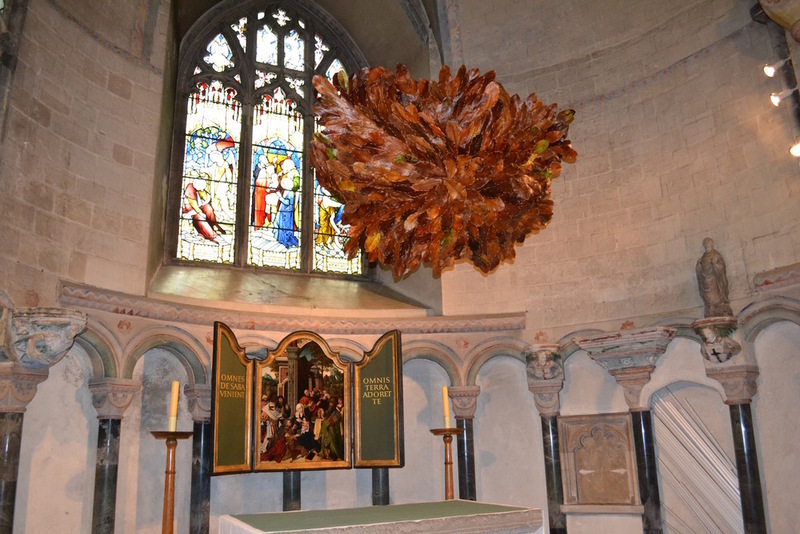 The leaves I gathered were from a Magnolia tree which lives in the Cathedral grounds, behind the walls of Jesus Chapel from which the piece was installed in. I was inspired to work with this material because of the translucent stain-glass like qualities that the leaves have when held up to the sunlight and the look and texture of the browning leaves reminded me of the leather bound books I had been observing in the Cathedral library. The process of using thread to stitch each individual leaf together also felt reminiscent of the traditional craft of bookbinding. Since then, I have continued to collect organic materials gathered from local trees, such as seeds and leaves, to create temporary site-responsive installations and unique works of art on canvas. More recently I have also begun translating these artworks into paintings.